Sclerotherapy is an injectable treatment for spider veins of the thighs, knees, calves and ankles, and when performed by a skilled injector with a great deal of experience, it can be quite effective. Sclerotherapy involves the injection of a product directly into the visible blue spider veins which ultimately leads to the collapses of that vessel and reabsorption of the damaged vessel by the body. As you might images, injecting such a small vessel involved a great deal of skill and a very steady hand, and therefore this procedure should only be performed by very experienced practitioners who tend to have a particular expertise and comfort level with injectable procedures of all kinds. 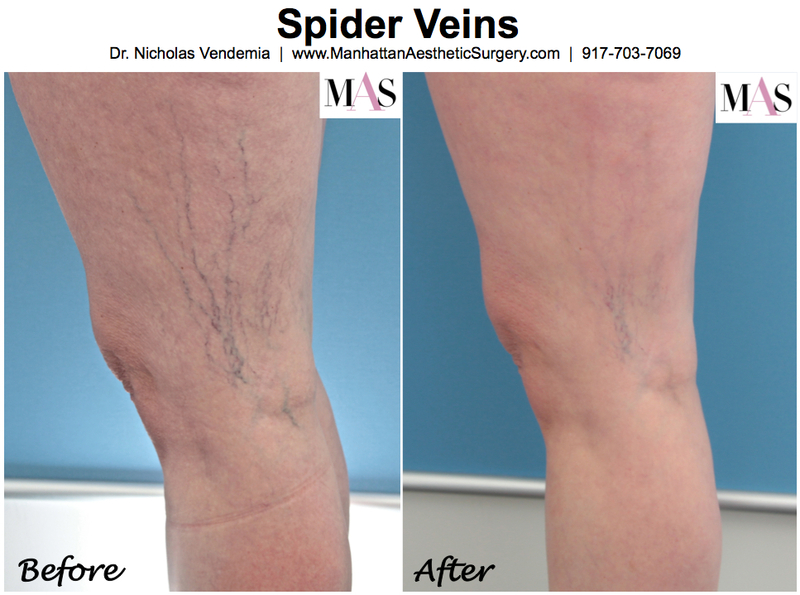 Dr. Nicholas Vendemia performs sclerotherapy injections for women and men in the New York metro area. We encourage you to contact us online or give Manhattan Aesthetic Surgery a call at 917-703-7069 to schedule a visit. Dr. Vendemia is a leading cosmetic surgeon in New York City with a reputation for custom care and beautiful results. Keep reading to learn more about vein treatment options, or take a look at the amazing results that real people like you achieved in our practice with Dr. Vendemia’s sclerotherapy techniques in our Before & After Sclerotherapy Photo Gallery. What products are used for sclerotherapy, and which on is the best? There are a variety of products on the market for sclerotherapy, but they are not all created equal. They all have different properties and success rates, but they are not offered equally in every vein practice, so you should do your research before having a consultation or treatment and know the right questions to ask. Asclera is one of the newest, and in our opinion the best, product on the market for treating spider veins. Asclera, also known as polidochanol, has a balanced pH which means that the injections hurt much less than with other products, and the overall success rate is in the range of 75%-85%, which is significantly better than with older products. The only downside is the slightly increased cost over other agents, but with a higher success rate and a more comfortable procedure, that additional cost will be easily justified by many men and women seeking this treatment. Hypertonic saline is probably the most well-known product used for sclerotherapy because it has been around for decades. The most common problem with saline is that is it not pH balanced so the injections can cause an intense burning sensation that can make the procedure quite uncomfortable, especially if you have quite a few veins to be injected. The success rate of saline is also quite a bit lower than with newer agents like Asclera, and although you may find it at a reduced price, it may not be worth the lesser investment if you don’t have a satisfactory outcome. We do not use hypertonic saline in our practice for the above reasons, but that is simply our preference and not a statement that the product should not be used by anyone. There are several other lesser known agents on the market for sclerotherapy, but Asclera and Hypertonic Saline are the two most popular by far. If you are interested in any of the other agents you come across in your research, please don’t hesitate to give us a call at 917-703-7069 for more information. Lasers are commonly marketed for spider veins, but we do not believe this practice to be effective and therefore no longer offer this option. Most lasers are designed to penetrate into the skin only fractions of a millimeter, which is just not deep enough to have any meaningful effect on the vast majority of blood vessels that are located well beneath the skin. In order to have even a chance of success with a laser, a huge amount of energy much be delivered to the skin in an attempt to penetrate deeply enough, and this not only causes tremendous discomfort, but also risks skin burns that can leave permanent scars on the legs. We do not recommend this treatment modality for anything by those veins that are deemed to small to treat with any injectable method, which is a very rare finding in the hands of a skilled injector. How many treatments are necessary to see results from sclerotherapy? For most men and women with moderate cases of spider veins, 2-3 treatments will produce a noticeable improvement, and in many cases a great number of vessels will disappear entirely. It is rare for anyone to have excellent results after a single treatment, but this does happen on occasion. This depends entirely on the skill and expertise of your injector, the equipment being used, and the product being used. Because Dr. Vendemia does sclerotherapy regularly and brings a variety of his steady-handed and gentle techniques from his experience in the operating room as a plastic surgeon into the procedure, it is often quite comfortable even for patients who admit to having a low pain tolerance. In addition, we only use Asclera for our injections which adds to the comfort level because it is pH balanced, and the smallest needles on the market to ensure that everything is in line for you to have a relatively pain-free, relaxing procedure. Is there any downtime after sclerotherapy? Each injection site will be red and raised (similar to a mosquito bite) for 24-48 hours, and while it is possible to bruise at each site, this is rare in our practice for the reasons described above. It is recommended that you take 24 hours off of strenuous physical activity and exercise after the procedure, but normal routine activities are fine. There is also no restrictions on bathing, but hot tubs and pools should be avoided until the injections sites are no longer red. Do I have to wear compression stockings after sclerotherapy? Yes, it is advisable to wear compression stocking in the range of 20-30mmHg compression for several weeks after the procedure, and for the rest of your life if you wish to prevent new veins from occurring. If you are prone to spider veins, compression stockings are the only way to slow their progression and halt the appearance of new vessels. Can sclerotherapy be used for varicose veins? Sclerotherapy is only indicated for vessels less than 3-5mm in size, which is much smaller than most varicose veins, but in some cases of smaller varicose vessels sclerotherapy can be moderately effective in reducing the bulge of the vein, but will usually not remove it completely. Most varicose veins require more invasive procedures like vein stripping or endovascular approaches for best results. Are you considering sclerotherapy with Asclera in New York City? We offer the most innovative techniques, the highest success rates, and the most comfortable injection technique in the industry. Please feel free to contact us online or call our office at 917-703-7069.